Just finished reading the DC Comics #1s that were in my hold and/or on the shelf this week: Blackhawks (on shelf), All Star Western (in hold), Justice League Dark (in hold), Teen Titans (in hold), Aquaman (on shelf), Batman The Dark Knight (on shelf), Savage Hawkman (in hold), and Superman (in hold). Loved Superman, Aquaman (I know, right? ), and All Star Western and will talk about them in this week’s podcast. I enjoyed Batman The Dark Knight, Savage Hawkman, Blackhawks, and Justice League Dark, which were all “set up” stories that gave me enough to be interested, but didn’t tell a complete story like Superman, Aquaman, and All Star Western. I was a little disappointed in Teen Titans because it didn’t give me as much as the others did, but I’ll stick it out with the teen-team book a bit longer. 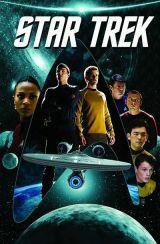 Big surprise this week was IDW’s Star Trek #1, that I’m saving for the show. Also read Dark Horse’s Angel and Faith #2, which was good. Now onto Marvel! First stop, Ultimate Spider-Man #2!